Memorial Day is a day of remembrance for those who have fallen while serving our country. The day was originally founded to recognize soldiers in the Civil War, but later expanded to give tribute to all service members. For the bravery and service of our current military members and veterans, the VA offers programs that enhance the quality of life and provide options that aid the military lifestyle. One such program is the VA Home Guaranty Loan program. The VA Home Loan program was established in 1944 to help veterans and active duty service members more easily achieve homeownership. Since service members move more frequent than most, conventional lending programs offer less of an appeal. Through the program, military members are able to obtain a mortgage partially backed by the VA that gives them benefits not commonly found in conventional lending programs. Traditional home lending programs usually require good to above average credit, a large down payment of close to 20%, and charge Private Mortgage Insurance (PMI). Due to the mobile nature of military service members, most veterans and active duty service members have little chance to build savings or strong credit. The VA Home Loan program also has high loan limits, which is great for military members interested in purchasing a home in Hawaii, where homes can vary in price. In higher priced real estate markets, VA Home Loans can even be secured up to $1,000,000, without the need of a down payment. The next step is to acquire your Certificate of Eligibility (COE). This can be done by contacting a Hawaii VA home loan specialist like VA Mortgage Center or by calling the Department of Veterans Affairs. A VA loan specialist can streamline the process and obtain the certificate in a matter of minutes, whereas the VA can take up to two weeks to process the request. Although the VA Home Loan Program has no credit or income requirements, most VA-approved lenders will require a mid-range credit score of 620 in order to secure financing. Regardless of their credit history, all interested veterans and active duty service members are still encouraged to apply as even those with a history of bankruptcy and foreclosure have been approved in the past. For more information, contact a VA home loan specialist today! Bird McIver is a locally famous saddle-maker and horse-rescuer (see “A Horse, of Course – Part I“). I asked her what it costs to buy a horse on the Big Island. Bird McIver rides Joe: a young horse being trained for polo. Another source for horses – at a much lower cost – is a horse-rescuing operation. The Hawaii Humane Society has one, and so do Bird and her husband, Colin; they call it CB Horse Rescue. Bird McIver riding sidesaddle on Coosa Lani, at the Hawaii Quarter Horse Association's Fun Day Show. “What’s it like to own a horse here?” The question came from a family that was looking at a house on pastureland. I know a little about horses, but Bird McIver is an expert: she’s famous in local equine circles for making fine custom saddles, and for rescuing horses that have been abused or abandoned. Bird will tell us about buying a horse on the Big Island, in my next blog. If a major road or highway is closed somewhere, as it might be after an accident; or if bad weather or a natural disaster is approaching, the Hawaii County Civil Defense Mobile Alerts program can tell you almost instantly. It will send the news directly to your cell phone, as a text message. Now, I wasn’t going to be driving on Highway 19, past the 44- and 45-mile markers, that particular day. But some day, news like this is bound to come in handy. If a service like this were merely “handy,” though, it wouldn’t be worth telling you about. But consider that, a few days later, around 8:30 a.m., Civil Defense sent a text message that there’d been an earthquake and tsunami in Samoa. That is news that everyone here has to pay attention to, because any such event in the Pacific Ocean could potentially send a tsunami to Hawaii. And indeed, Civil Defense issued a tsunami “watch” for the Islands. Ultimately, the Samoan tsunami did not threaten Hawaii, and the watch was cancelled. But a friend across the island phoned, that morning, to ask if I’d heard anything about the Samoa quake, and I was able to read him what I’d gotten from Civil Defense. But at such a great speed of travel, the worst-case scenario is when a tsunami is generated right here, by an earthquake in Hawaii, leaving people practically no time to escape. 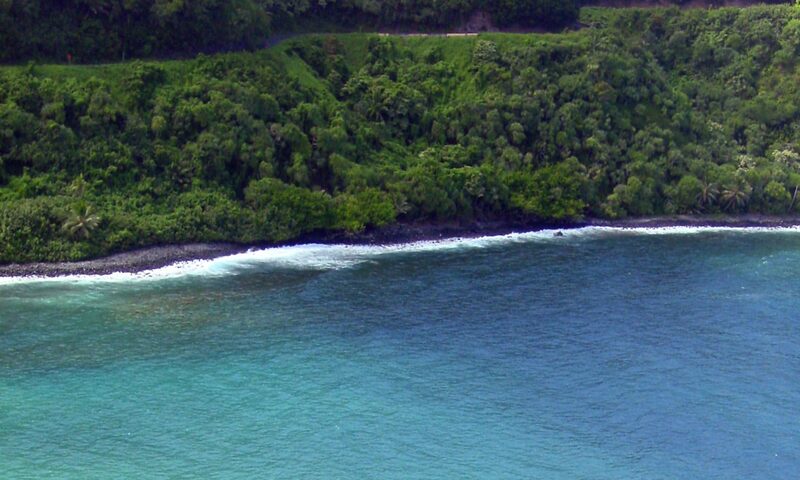 This happened one night in 1975, when a quake beneath Mauna Loa generated a tsunami that caused a beach in Ka’u to subside. Within only a couple of minutes, the ocean surged in, swamping kids and counselors on a camping trip, and killing several. Remember: If you’re near the ocean and you feel an earthquake, drop everything and head for high ground immediately! That's not a tsunami, just very high surf at Hilo Bay during a storm. But the waves are high enough for the County to close the Bayfront highway - and for Civil Defense to text a warning to that effect. One night in October, there was a small earthquake here. It didn’t have much power: we felt the shake, but nothing fell off the shelves. Fifteen minutes later, though, Hawaii County Civil Defense text’d me that it measured 4.1 on the Richter scale, that it was centered under the sea southeast of Pahala, and that no tsunami had been generated. Okay – that night, the news was not much to worry about. But it was reassuring, and it trumped the guessing-game (“Wha’d’you think? Four-point-something?”) that inevitably follows a quake. All local telephone directories have Civil Defense pages near the front, with maps of low-lying areas highlighted for evacuation in case there’s a tsunami emergency. To be fully informed about tsunamis, I urge you to visit the unique Pacific Tsunami Museum on Kamehameha Ave. in downtown Hilo; or go to its website at www.tsunami.org. Of course, traffic and emergency notifications are not all that Civil Defense can do for you. Want to know how near you or your visiting friends can get to wherever Kilauea is erupting today? Or whether your favorite viewing spot is open or closed? You can check with the Hawaii Volcanoes National Park, of course; but it’s Hawaii County Civil Defense that has a dedicated Lava Viewing Hotline. Phone 808-961-8093. As for those emergency alerts, some – though not all – cell phone service plans charge you for incoming messages. But the folks at Hawaii County Civil Defense are not likely to send you something every day – and when they do, it might just save your life! Sign up to receive these alerts by going to: http://talismanlbs.net/hccd, register and filling in the form. Believe me: you can afford it. Nighttime winter temperatures along the coasts, here, can get down to 60° F. Add the cooling effect of clouds and rain, and on the eastern side, at least, you can expect nights in the 50s. As you get above sea level, anywhere, ambient temperature falls 3° F for every 1,000 feet up, so many places here are downright chilly in the winter: Volcano, at 4,000 feet, gets frost! But homes in Hawaii don’t have furnaces, and few if any are insulated against cold (or hot) weather. Other than wrapping yourself in heavy clothes, if you want to stay warm indoors, you’ll have to generate heat, and the easiest way is to burn wood. You could soak all day in a wood-fired hot tub, but more likely you’d want to sit around the house near a modern wood stove or fireplace that’s engineered to send a lot of heat into the room, instead of up the chimney. They’re are sold in specialty stores in Hilo and Kona, and can be ordered through home-improvement stores, too. You must get a commercial model, and not build one yourself, because it has to meet strict local construction codes, and the building-inspectors here are very finicky about anything that could be a fire-hazard. What isn’t widely available, however, is wood. You won’t see cords of firewood stacked outside supermarkets and garden supply stores, as you do on the mainland. (A true cord, by the way, is four feet wide, four feet high, and eight feet long.) Sometimes, a classified ad in one of the local papers will offer firewood. Just make sure that the pieces are cut small enough to fit in your firebox. You could, of course, go out and cut your own firewood. Unless you have an especially dense stand of trees on your land, that you really don’t want to keep, you probably will have to go elsewhere. Obviously, you can not go logging in Hawaii’s forest reserves or parks; and until you’ve lived here a while, you probably will not know or hear about neighborhood trees that have to be cut due to land-clearing, hazard-removal, and so on. You should certainly consider cutting weed-trees, though. Many property owners – maybe you, too? – have thickets of rose-apple or waiawi that they’d like to get rid of. Waiawi (“vy-vee”) is strawberry guava, an especially hard wood that burns hot; but the trunks are not especially thick, and hence not easily split by hand. A client of mine purchased a house whose long driveway was lined with tall cedars and pines. These exotics were probably intended to be harvested as Christmas trees, but had not been cut in time, so they stood over 50 feet tall, deeply shading the driveway, and blocking half the view from the house. He had them professionally cut down. The branches and leaves were ground up into mulch, which was piled up near his garden; and the logs were cut to fit in his fireplace. Citing the old adage that you get warm first from the exercise and then again from burning the wood, he now spends an hour or two each autumn and winter month with an axe, maul and wedge, happily splitting those logs. Getting a pro to cut your fire-logs frees you up to split and burn them. care: ensuring that the cutting-edges are sharp, keeping both the engine and the chain properly lubricated, etc. Like installing electrical circuits or plumbing, cutting wood with a chain-saw is a task best left to experts. You probably don’t want to live anywhere without hot water. But fortunately, that’s the easiest convenience to have, off-the grid. In our warm and sunny climate (sunny enough, even in Hilo), a simple black plastic water-bag on the roof will give you hot showers from afternoon through early evening. Utility executives know this. They also know that heating water with electricity is terribly wasteful and inefficient; and that they may never get approval to build another power-plant here if they don’t help to hold down demand. So the Hawaii Electric Light Co. (HELCO) is offering households huge incentives to replace electric water heaters with solar water-heaters. You can’t go wrong with solar. Ideally, you should have a broad southern exposure, but almost any place with open sky views should be sufficient to generate heat from the sun. You will, however, need a tank, and some backup heat source (propane or electricity) to keep the tank’s temperature constant. For an attractive alternative, consider an “on-demand” water heater, in which a small propane burner fires up only when you open a hot-water tap. There’s no tank (a cost-saving in itself), and though the heater may have a pilot-light, it isn’t burning a lot of gas to maintain a high temperature when you aren’t using hot water. These systems are very inexpensive, and easily installed by any plumber. Just be sure the burner is vented, for safety, to the outdoors. You could also combine a solar water-heater with a slightly more costly version of the on-demand heater, which has a temperature-sensor built in. It can then raise up to full hot-water temperature the water that’s already warm from the sun. Those solutions are excellent for showers and small tub baths. As for a resort-size, Jacuzzi-type hot tub, big enough for two or more people, you will need sufficient electricity to run the “jets.” But a more important consideration is that heating such a large volume of water takes a lot of energy – quite likely more than can be heated by the sun in single a day. But there are other ways to heat a big tub of water, especially if you’d like your hot-tub experience to be naturalistic. In old plantation days, a Japanese farm worker would build a bathhouse, separate from his home, with a wood-fired furo inside. He’d lay a brick-and-mortar firepit and chimney, set a sheet of copper over the firepit, and make a tub out of redwood (and a redwood grille, to keep from sitting down on the hot metal). An hour or so after starting the fire, the tub water would be hot enough to soak in. Traditional bathhouses have drains in the floor, because the Japanese always wash and rinse themselves off first, and only then get into the tub. Many years ago, I lived in a house near Hilo that had exactly that sort of backyard bathhouse with a brick-firebox and copper-sheet furo. I would jokingly compare the experience to the cartoon image of missionaries being cooked in a cannibal’s cauldron. Fortunately, there is a modern alternative. It’s called a “snorkel stove” (www.snorkel.com) – an aluminum firebox that sits in one part of the tub, separated from the bathers, for safety, by a wooden screen. Since it takes up about one-person’s-worth of space, the tub has to be slightly bigger than you might otherwise need. Having a separate bathhouse makes the experience seem special, somehow; and since the tub isn’t in your regular bathroom, it’s more relaxing and more attractive, especially if you share the tub with family or guests. You’ll probably want to site the bathhouse close to your home, though, and in rainy places, link the two structures with a covered walkway. Every electric motor and light bulb in an ordinary house runs on alternating current (AC). And though your cell phone or laptop computer runs on direct current (DC), you keep them charged up with a little transformer you plug into an AC outlet, that “transforms” AC into DC. No matter how you (or the utilities) generate power, whether from fuel, wind, hydro, or the sun, it starts out as DC and must be changed – or, more accurately, “inverted” – to AC. That’s done through (what else?) an “inverter” that sits between your batteries and the breaker-box for the house’s electrical outlets. The inverter also keeps the electricity from fluctuating, so your power is as consistently smooth as it would be from the grid. You could skip the inverter, and have an all-DC house. There are DC versions of most appliances, including TVs and refrigerators; and when people here started living off the grid, in the 1960s and ’70s, home-sized inverters were not commonplace; so going entirely DC was the only way they could have modern conveniences. But DC appliances are not cheap, and you won’t find them in local stores. Making an all-DC house also forces you to site all the components of your system, including the outlets, very close together, because (unlike alternating current) direct current loses strength if it has to run through more than about 50 feet of wire. So, to live off the grid, you need batteries and an inverter, too. The fact is: we live in an AC world. You need batteries. Here, the first five (of sixteen) 24-volt batteries are being installed in a household system. An inverter (not shown) turns the batteries' DC power into AC. As for cooking, you will have to forget about an electric stove – you can not possibly generate enough power for that. Get a gas stove, and make sure the installer sets up all the burners for propane (instead of natural gas, which is not sold in Hawaii). Propane is easily obtained. Tanks range in capacity from backyard-grill-size, to four-foot-tall cylinders, to horizontal giants. You can take the smaller ones into town to be refilled, or pay an additional but small monthly fee (less than $10) to have a gas company driver deliver fresh tanks and/or refill them at your home. There are, by the way, refrigerators that run on propane. They are more expensive and slightly less efficient than electric refrigerators, but if your generating capacity is limited, and you’re getting propane anyway, for cooking or heating water (which I’ll cover next time), you may want to at least check and see if a propane refrigerator will suit your needs. It is, in any case, one more way to stay off-the-grid. Turning sunshine into electricity is the most popular way to generate your own power, here, although two conditions must be met. First, you really have to have a good view of the sun all day: no trees or hills shadowing the house. And second, you have to have dough: the initial investment is high, and likely to remain so for the near future. A “family-of-four” will probably need a system costing $30-40,000, including batteries and control equipment. But electricity from the Hawaii Electric Light Co. (HELCO) costs more than 30 cents per kilowatt-hour, pushing utility bills up into thousands of dollars a year, and the rates will only go higher. So, a solar system should break even in ten years or less. Moreover, the price of photovoltaic panels is slowly coming down, while their electrical efficiency keeps going up. And there are no ongoing costs: once the system is in place, your electricity is free, and your batteries get charged up every day! Two recent technological developments make solar increasingly attractive. The newest photovoltaic collectors aren’t like heavy picture-frames, with glass on top. They’re lightweight, flexible sheets of plastic that are available either as shingles or as peel-and-stick strips that lie flat, between the ridges of standing-seam metal roofs. And these new materials are more sensitive to ultraviolet light than the glass panels are, so they keep on making electricity even on cloudy days, when there isn’t as much “visible” light. "Building-integrated photovoltaic" (BIPV) panels adhere directly to a standing-seam metal roof. Framed-glass photovoltaic panels are mounted on a carport. If your land is close to an existing utility pole, the Hawaii Electric Light Co. (HELCO) may accept whatever electricity you generate and, in effect, store it for you in its grid. But hey! – this is about living off the grid. And that means storing your electricity in batteries. The right kind of batteries for home-size power-plants are similar to car batteries, but larger and heavier, with higher electrical capacity (24- or 48-volt, instead of 12). And their installation has to meet building codes (e.g., you can’t put them in the crawl-space under the house). To keep your system operating at peak efficiency, you will have to take on some responsibilities that have traditionally been shouldered by the utilities. Though you don’t have power-poles to climb, or high-tension wires to string, you will have to perform some regular maintenance tasks, the equivalent of those that utilities ordinarily do, and the cost of which they bundle into their monthly bill. So, for example, you must ensure that the fluid in your batteries is at the proper level, by topping them off with distilled water, once a month. And as soon as you do that, it’s a good idea to run your backup generator for at least an hour or two, not only to help your batteries stay fully charged, but also to keep the generator itself in top running condition, so it’s always ready in case of emergency. Go solar, and you also ride the wave of the future. If we in Hawaii are ever going to free ourselves from imported petroleum fuels, we will have to generate more and more of our electricity from the sun. HERE ON THE BIG ISLAND – Could You Live Off-the-Grid? You certainly can live where none or only some of the Big Island’s commercial services – water, electricity, telephone, television, internet – are piped into your home for a monthly fee. And you don’t have to rough-it to live off-the-grid. You can enjoy a thoroughly up-to-date lifestyle, with all the accoutrements of a modern home, without being a customer of any commercial utility. In this and the next few blogs, I’ll tell you about the challenges and the strategies of acquiring for yourself the necessities of life here on the Big Island. Water comes first, of course. Hawaii County has an extensive water system of wells, pumps, pipelines and meters, with high quality and modest rates. But where 40 or more inches of rain fall every year, you can reliably collect your own water from the gutters on your roof. Rain is (shall we say) especially abundant in Hilo and Puna; so even in neighborhoods, there, where County water is easily available, some homeowners choose to use catchment tanks. This house, though only seven miles from downtown Hilo, is entirely off the grid. The water tank – a metal frame lined with plastic – is in the foreground. The roof also has photovoltaic panels for generating electricity. A so-called “family of four” should have at least a 10,000 gallon tank, which is generally a cylinder about twelve feet in diameter and eight feet high. Although some old redwood tanks are still in use, and are aesthetically quite pleasing, they are rarely if ever built nowadays. More common – and actually better, because they do not decompose – are tanks made of sheet metal and lined with tough plastic liners (very much like above-ground swimming pools), or tanks made of ferro-concrete (in which cement, sprayed onto a metal “rebar” frame, hardens into concrete). The latter is more expensive but will last much longer. Also, since rainwater is naturally slightly acidic, contact with the slightly alkaline concrete tends to neutralize the “ph” of stored water. Once you have water in the tank, you still have to pipe it into the house. You’ll want some kind of filtration, because dirt and dust, or fragments of leaves, always wash down from the gutters; and though they generally settle to the bottom of the tank, little bits of stuff do sometimes get into the house’s supply line. But particulates like that are easily intercepted with simple filters which, like their smaller under-the-sink cousins, are typically replaced once or twice a year. Getting that supply to flow inside the house’s plumbing, however, requires constant pressure in the pipes. Standard household water pressure is 40 pounds per square inch (psi). If your tank can be sited at least 40 feet higher than the highest faucet in the house, gravity will supply enough pressure. But unless your land is a steep hillside, that won’t be an easy setup. Besides, it’s much easier to site the tank close enough to the house to take the runoff from the roof. So the force that pushes water through the plumbing typically comes from a pump and a special tank which, together, maintain constant pressure. To have that you’ll need electricity, which I’ll tell you about next time.